Last year we featured a blog on a French supermarket chain Intermarché who launched a glorious fight against food waste with their ‘Inglorious Fruit & Vegetables’ campaign. This was a great initiative, something that Australia has been in desperate need for. For too long we’ve been caught up on how our fruit and vegetables look and not focussed on how our product choices can help to combat food waste and our local farmers. 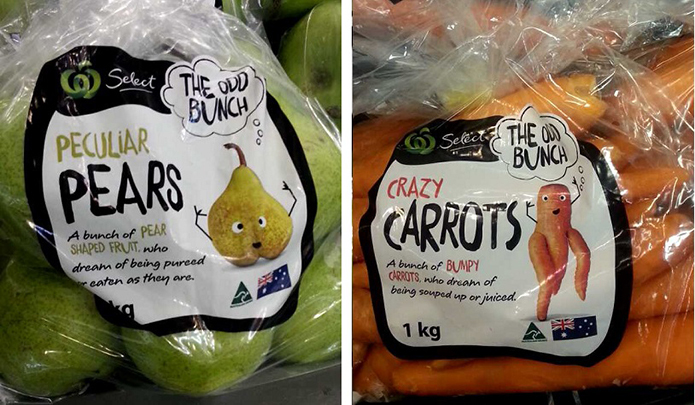 I’m pleased that one of our large supermarket chains, Woolworths is taking some steps in the right direction to combat fruit and vegetable waste by stocking imperfect produce that they are branding as The Odd Bunch. This follows a recent campaign by Harris Farm Markets called Imperfect Picks which also educates the market on imperfect looking produce. But is this enough to change consumer perception and buying behaviour and why aren’t food retailers doing more to stop this ridiculous trend? Growing up on a farm I understand that fruit and vegetables come in all shapes and sizes and in my opinion the quirkier the better, somehow it makes the produce seem more natural. So when I first spotted a bag of The Odd Bunch carrots in Woolies I was delighted and the best part was they were cheaper than their so called perfect counterparts. It also helped my social conscious to know that I was helping to stop food waste by purchasing a bag of “Crazy Carrots”. A staggering 25% of fresh produce is rejected because of imperfections or cosmetic damage. The absurd thing is that the produce is still tasty and healthy but because we’ve been conditioned to expect perfect shapes and colours in our fruit and vegetables retailers won’t stock the produce because apparently we won’t buy it. Who is to blame though? The retailers for not stocking imperfect produce or consumers for being so picky about fresh produce? 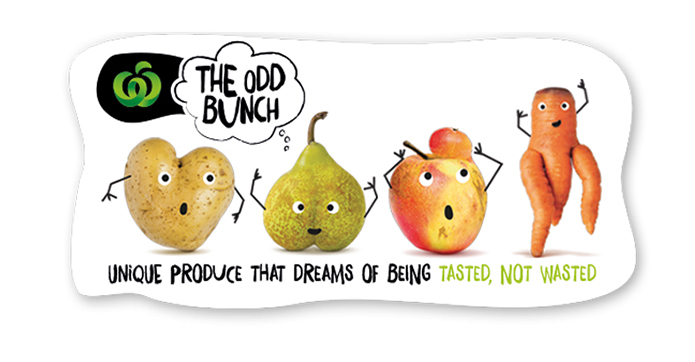 Since the Odd Bunch was introduced into Woolworths stores last December more than 14 million kilograms of the produce has been sold, according to Daily Telegraph. This is staggering, but I can’t help but notice a distinct lack of this type of product on the shelves in Woolworths, rarely do I come across the imperfect produce and it certainly isn’t front and centre. I can’t help but think if 25% of fruit and veg is not deemed suitable for supermarket shelves there is a lot of opportunity to stock more of this produce. When doing research for this post there was a lot of commentary on who started the idea for such a campaign and which one is more effective. In the end, does it really matter? The most important thing is that work is done to shift consumer perception especially by our national supermarkets who have a huge influence over the buying habits of the Australian consumer. In my opinion the more retailers that speak about this message the more we are likely to change perceptions about the appearance of fruit and vegetables in our supermarkets. Zerella Fresh is a major supplier of carrots, onions and pumpkins to Woolworths. The company’s national sales manager, Peter Brinkworth, said the new initiative would help it sell more of the 1000 tonnes of carrots it pulls up each week. Mr Brinkworth said between 10 and 30 per cent of its crop was not used for retail sale. It was either sent to a processor, sold for livestock feed, given away or dumped. The campaigns listed here are a step in the right direction but as a consumer I want more from food retailers. I want more choice when it comes to selecting not so perfect fruit and vegetables instead of a few hidden bags of pears and carrots. I want to be given the choice to stop food waste and support local farmers. A lot needs to be done to change the market perceptions and create demand but we can’t go on ruling out 25% of fresh produce as unsuitable for supermarket shelves because it isn’t pretty.